Pictured are the presentation are Poet Laureate Laurel Blossom, winner Nathan Kulp, Clay Studio owner Beth Thornton and Potter Justin Guy. Our omniscient God deserves love each and every day. He is the knowledgeable potter and we are the vulnerable clay. The ceremony was held at The Clay Studio. 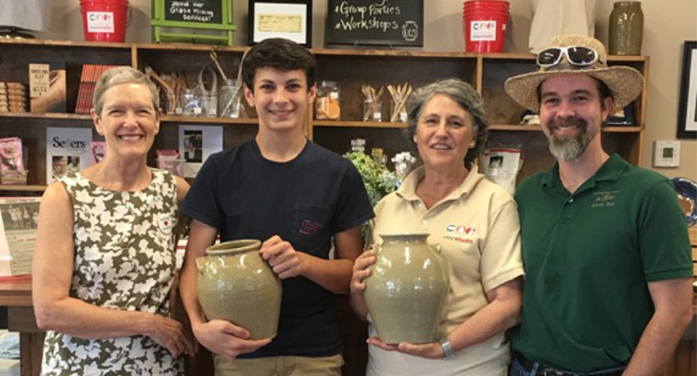 Poet Laureate of Edgefield, Laurel Blossom, presented two Edgefield jars made and decorated by master potter, Justin Guy of The Phoenix Factory (formerly the Old Edgefield Pottery): one to Nathan to take home, and one to The Clay Studio to put on permanent display. It is hoped that these jars will be the first in a series of Edgefield jars to be awarded in Poetry Meets Pottery over the coming years. The Clay Studio is open Monday through Saturday, 10 a.m. – 4 p.m. It offers pottery supplies, rental studios, classes for adults and children, and more. On July 9, The Clay Studio will host the afternoon activities for DAVE DAY, a daylong celebration of the legacy of Dave the Potter. Dave’s handmade Edgefield pots are justly honored throughout the nation: not only are they beautiful, and some very large, but a number of them are also inscribed with original rhymed couplets. It is in honor of Dave’s legacy that the Poetry Meets Pottery couplets contest was conceived. DAVE DAY festivities begin at the Aiken County Historical Museum on the evening of Friday, July 8th with children’s activities and a showing of the documentary film, “Discovering Dave.” On the morning of Saturday the 9th, the festivities move to Edgefield’s town square, where there will be live music, displays of work by local artists, and demonstrations of 19th century crafts. Lunch will be available at Edgefield’s wide range of excellent restaurants and cafes. From 2 – 4PM at The Clay Studio, noted speakers and entertainers will continue the celebration. A long-missing piece of Dave’s story will be revealed at the end of the program! All DAVE DAY events are free and open to the public.